Bio-sand filters were developed by Dr. David Manz over 30 years ago. He designed them based on larger scale versions that had been used on a community level for decades. His goal was to create a household sized version that could be used in developing countries and by people living off grid so they could filter contaminated source water. To date, bio-sand filters are being used in many developing countries around the world because they’re an effective and cost efficient way to provide access to treated water. We love the bio-sand filter for many reasons. It’s a simple, yet effective technology. When installed and used correctly a bio-sand filter can remove up to 99.99% of all disease causing pathogens – the microbes that make us sick. The small percentage of remaining pathogens is something that our bodies can fight off through our immune systems. The filters are made from simple materials – sand, gravel and cement. There are plastic versions of the filter, but we’ve chosen the concrete version for it’s durability, and because building it in country means we can have a constant supply on hand to meet the demand. It provides full time employment for local Haitians and builds into the local economy through the purchasing of materials to construct the filters. The filters are simple to use and they don’t require any replacement parts, so there is no ongoing maintenance cost for the family using it. Bio-sand filters can filter most source water, so people can use the water they have available to them. Many of the communities we work in are very rural and far away from any option of buying treated water, so this is a key thing. Bio-sand filters are a great filtration model for Haiti because they work with the challenges faced by many people here. They’re simple, easy to maintain, made from local materials, and are durable. It’s what we call an “appropriate technology”. 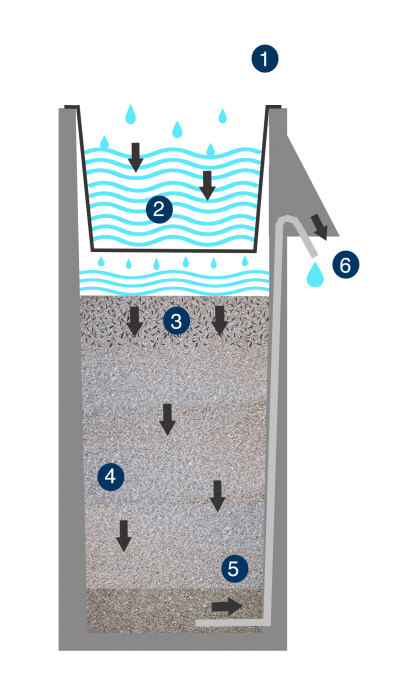 Click on each stage to learn more about how the bio-sand filter works. 1. Water is poured in the filter. The lid is removed from the filter and source water is poured in the top into the reservoir. Bio-sand filters can use most source water, with the exception of sea water or anything that has chemical contamination. The bio-sand filter uses a natural process to attack disease causing pathogens, and this process won’t remove any minerals or chemicals already present in the source water. The water that was poured into the filter first passes through a diffuser basin. It’s essentially a square bucket that sits on the top of the filter walls. It’s job is to slow the flow of water going into the filter so the top of the sand bed doesn’t get pitted and disturbed. The reservoir in the filter holds about 3 gallons of water at one time. If that water was just poured into the filter without the diffuser basin it would destroy the bio-layer and make the filter useless. At Clean Water for Haiti we’ve developed an injection molded plastic diffuser basin that we use for all of our filter installations. The mold to make the diffuser basins stays in the US and is available for any bio-sand filter project working globally who wants to make an order of diffuser basins for their own work. It’s just one more way Clean Water for Haiti is impacting the world with clean water. After the water passes through the diffuser basin it comes to rest on top of the sand bed. There are always two inches of water above the sand bed, something that’s regulated by natural syphon and determined by the length of the tube coming out the filter nose. The water will push down and enter the “schmutzdeke” or bio-layer – the heart and soul of the bio-sand filter. This is where all the hard work of water treatment happens. Inside each filter is about 80 pounds of fine sand. Every bit of water that gets poured into a filter has good microbes that help keep our bodies healthy, and disease causing microbes. The healthy microbes cling on to the sand grains and attack the disease causing microbes for food. Oxygen can only exist in sand to a certain depth, and in a bio-sand filter that’s in the first four inches, so that first four inches in the sand bed is a living, thriving community of healthy microbes feeding off of the disease causing microbes. Things like worms, protozoa, bacteria and viruses are attacked and destroyed. This is a process that has been happening in nature since the beginning of time, and we can make it work at a household level. After the water moves through the bio-layer gravity continues to push it down through the sand bed. Because oxygen can’t survive down in the lower parts of the sand bed, any disease causing microbes won’t be able to survive because they won’t have the needed oxygen to live. The bottom two inches of the sand bed are made up of coarse grain sand, which helps stop the fine sand in the rest of the sand bed from moving down into the gravel bed and tube. 5. Gravel bed & tube. The water moves down through the sand bend and down into two inches of small gravel. The gravel helps stop the sand from blocking the tube and keeps the water flowing through the filter properly. The water enters the tube and pushes up into the filter nose. When installed this tube is disinfected with bleach so that the water can’t get recontaminated after filtration. The water passes up through the tube and out the spout in the nose of the filter. The length of this spout is what helps keep the water level above the sand bed regulated and the bio-layer supplied with oxygen. The water flows from the spout into a water storage container. Each family that gets a filter is given extensive and repeated training on how to safely store their treated water in order to avoid recontamination.